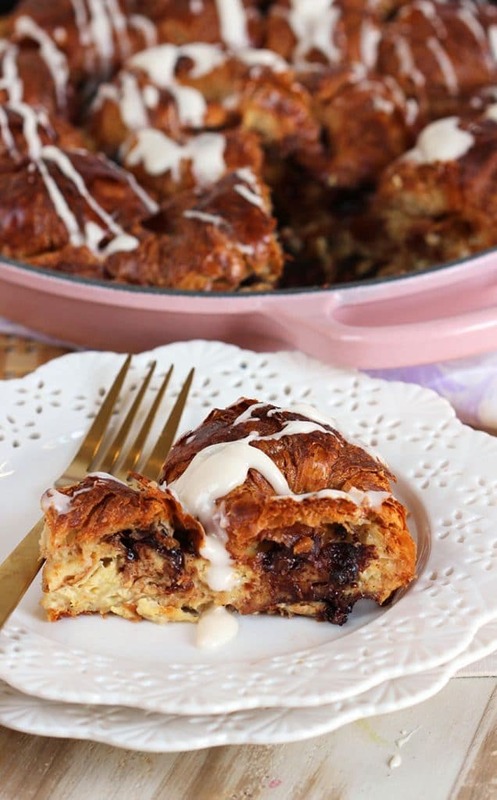 A skillet filled with sweetness, this buttery Chocolate Stuffed Croissant French Toast Casserole is the star of the show at your next breakfast or brunch party. Flaky, light croissant is filled with bittersweet chocolate then blanketed with a cinnamon custard that’s baked to perfection. Creamy, sweet and absolutely To.Die.For. 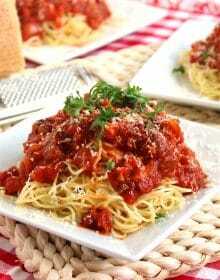 Disclaimer: This post is created in partnership with Le Creuset and Pampelonne. All opinions and statements are mine, as always. I just read an article on Facebook that said “If you decorate for Christmas early….you will be happier.” Or something like that. And so, my tree is up….and I’m happier. I’m watching The Voice with my Christmas tree lighting up the room and I’m very, very happy. I’m looking forward to the holiday season, the twinkle lights and all the reasons to start entertaining friends on a Sunday afternoon. Brunch season has returned….and I couldn’t be happier. Except, maybe if I had a skillet filled with Chocolate Stuffed Croissant French Toast Casserole and a French 75 in my hand. Seriously, there’s something about brunch that I just love. I think it’s the fact that it’s a little later in the morning….but not quite lunch. 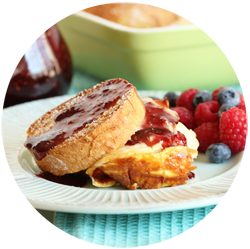 Where you can decide whether you want a sweet dessert-like breakfast without anyone giving you the side eye or a big, heavy savory comfort dish that will have you in a food coma in no time flat. And cocktails are almost a requirement for brunch. 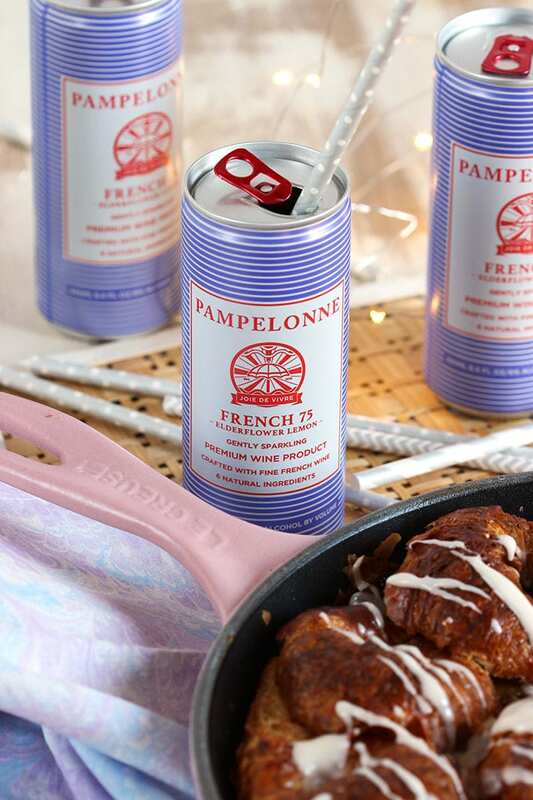 So, I teamed up with Le Creuset and Pampelonne to bring you the most epic brunch recipe of all time……Chocolate Stuffed Croissant French Toast Casserole paired with Pampelonne’s new Sparkling Wine French 75. It is seriously dessert for breakfast. The Pampelonne French 75 is three distinct flavors, layered, and emerge in succession. First, aromatics of juniper. Next, Meyer lemon, tart but balanced sweetness with notes of spicy bergamot. This is the backbone of a classic French 75. The signature, Elderflower, rounds out the finish. Low cal, low carb, gluten free, natural. 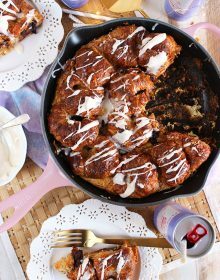 The Chocolate Stuffed Croissant French Toast Casserole is incredibly easy to make but looks stunning and super fancy when you pull that Le Creuset Sugar Pink Skillet out of the oven. To start, I split a bunch of mini croissants that I bought at the grocery store in half then line the skillet with the bottoms. Next, I sprinkle the croissant halves with a whole mess of chocolate chunks and top with the remaining croissant halves. 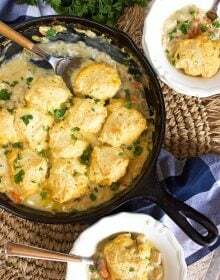 Last, I whip up an easy egg custard, similar to the one in this breakfast casserole, but spiced with cinnamon, vanilla and coffee extract for extra pow……and pour it all over the croissants. Let it hang out for just a bit while you sip your Pampelonne French 75 then bake it in the oven until it’s golden and puffy. 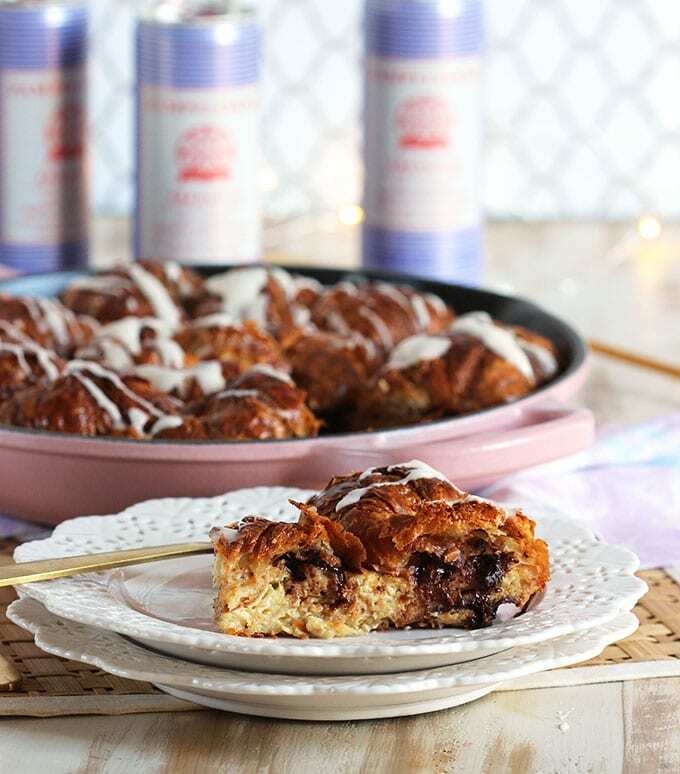 I drizzle the top of my Chocolate Stuffed Croissant French Toast Casserole with a quick and easy glaze just to make it look all fancy but you can totally go rustic here….skipping it altogether. It’s definitely not a requirement because the first bite is heavenly….rich chocolate, buttery croissant, vanilla-y custard. 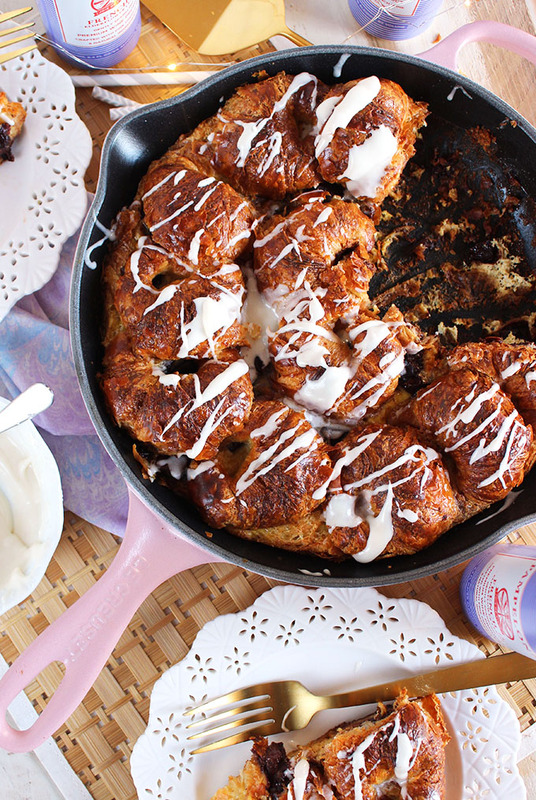 It’s amazing and the perfect centerpiece for any brunch spread. 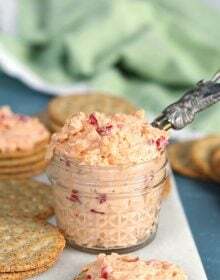 It would be fabulous alongside this Sparkling Fruit Salad and a few Smoked Salmon Canapes. Don’t ya think? 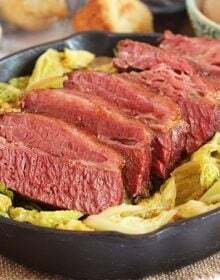 And I love the versatility of the Le Creuset Sugar Pink Signature Skillet because it goes seamlessly from oven to table like a rockstar! It features a helper handle for easier lifting and added control when moving between stovetop, oven and table. Cast iron skillets have long been treasured kitchen staples for stovetop frying and oven baking. Over time, the matte black interior enamel develops a natural patina that is ideal for searing and frying. Pour spouts on two sides allow for drip-free pouring. 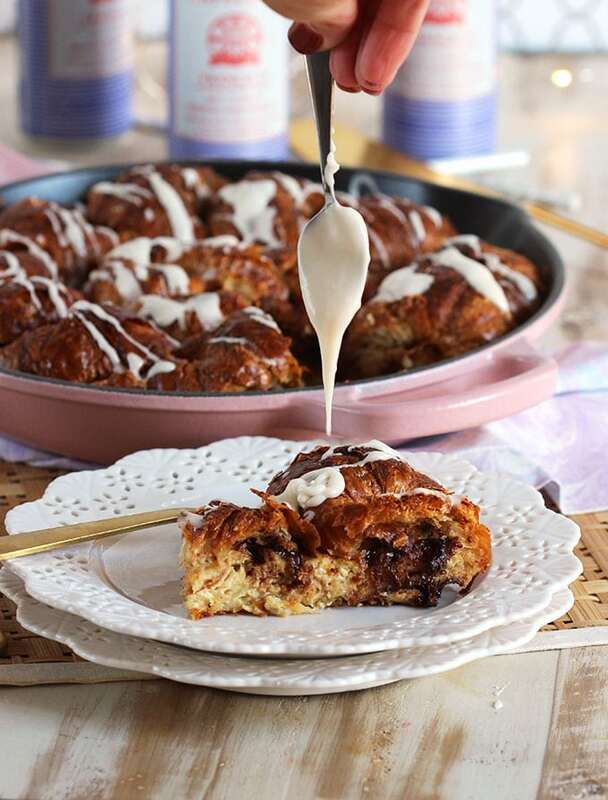 And to help you brunch like a pro this holiday season….Le Creuset and Pampelonne are offering up their brunch staples to one lucky reader! Enter to win using the entry form below…..and Happy Holiday season! 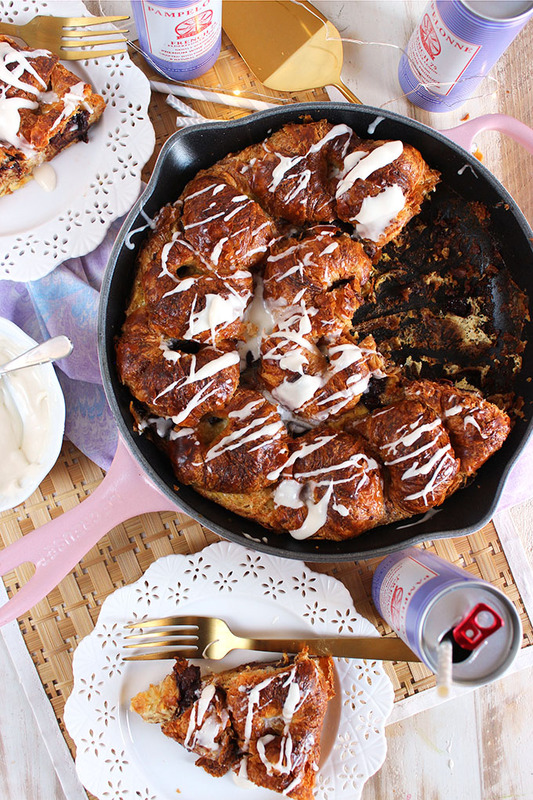 brunch time is perfect for this chocolate stuffed croissant French toast! Line the bottom of a 12 inch skillet with the bottoms of the croissants in a single layer, cut side up. Sprinkle the chocolate chips over the croissants and then layer the tops on the chocolate chips, cut side down. In a bowl, whisk together the eggs, half and half, cinnamon, vanilla and coffee extract until thoroughly combined. Pour the egg mixture over the croissants and allow to rest for 10-15 minutes so the croissants can absorb the egg mixture. Transfer to the oven and bake for 40 minutes or until puffed, golden and the custard is set. 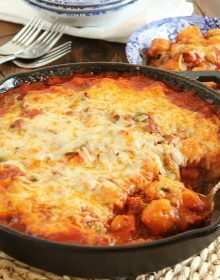 Allow the casserole to cool fro 5-10 minutes before serving. 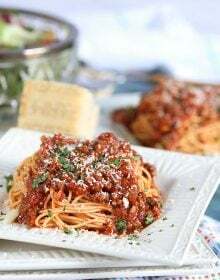 While the casserole cools, whisk together the confectioners' sugar and milk. Drizzle the glaze over the casserole. 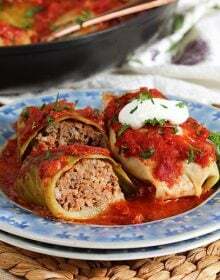 Casserole can be assembled up to 8 hours before, covered with plastic wrap and stored in the refrigerator until ready to bake. 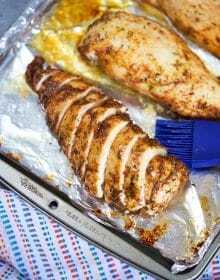 Remove plastic wrap and bake as directed. 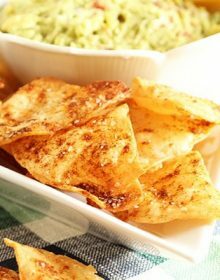 They look yum, a wonderful recipe idea for Christmas!